The last time I visited Greenwich Village NYC was in the fall of 2008. The weather was perfect. My great desire was a walking tour of the Village. The shops, coffee houses, restaurant and bar made it a pleasure for me to spend an entire day to walk around and take souvenir photos. Soon I found myself heading towards Bleeker Street and the apartments looked cozy. There on the left was a bright pink apartment house standing out from the rest and I just had to take a photo so that I could remember the scene when I got back to California. I've never seen a place that color before or since. While it would not be my choice, it does look good on this street. Canal Street for the crazy shopping experience. The art galleries are second to none. Coffee houses, bring your own Kerouac. Little Italy's Mulberry Street for the wonderful Italian food and local history. A chess shop or two to see the variety of boards and chess books. While visiting Manhattan don't forget to see spectacular Times Square in the evening hours after seeing a Broadway show in a great old theatre. My wife and I saw Jersey Boys and loved it. New York City Art Prints of Times Square, Greenwich Village, Washington Arch, New York City Public Library show famous places in New York City. Greenwich Village New York across from Washington Square Park. Greenwich Village NYC street scene is tranquil even though surrounded by a huge city and is a great place to enjoy the art of New York City. Enjoy this view of the New York City Public Library on 5th Avenue and its beautiful reading rooms. While not one of the most famous places in New York City, it is a favorite. This map of Times Square NYC is searchable. Click on the map to find hotels near Times Square, theaters, restaurants, stores. You can even print a copy of your customized version of the map to keep with you while in NYC. Times Square Street Level at night is an awesome sight to behold for both locals and tourists. The Washington Square Arch in Greenwich Village as seen from 5th Avenue. Many people were introduced to this view in the Robin Williams movie August Rush. This version of Time Square New York looks similar to my other versions but this one has the crowds of Sunday morning farmer's market in the street. To check out other artwork by Doug Dourgarian and see more links for this online art gallery click here for the web gallery of art . 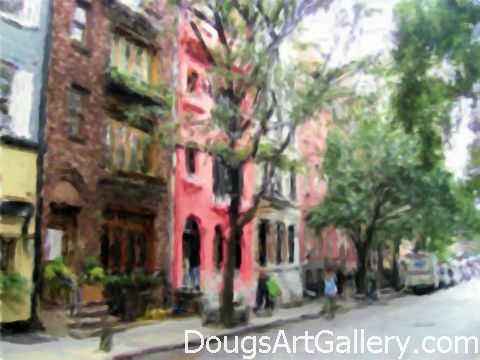 Click here to leave Greenwich Village NYC for more links to artists and their online art galleries, art prints and art posters. Browse the links found at the bottom of Home Page.